Bangkok, Thailand – The list of nominees of the first “World Buddhist Outstanding Leader Award” was recently released by the World Fellowship of Buddhist Youth (WFBY) and Thai National Office of Buddhism. They are a total of 72 individuals and organizations (50 international recipients and 22 Thais) slated to receive the inaugural award. The awards presentation will take place on Feb 15, 2014 at Buddhamonthol, Nakornpathom, Thailand, in commemoration of the national Magha Bucha festival. An event like this at any other time would have elicited general approvals. However, not all Buddhists are celebrating, unless if you happened to be associated with the recipients’ organizations or the organizers themselves. Apparently the key supporting organizer, the one providing logistics and venue for the event, is none other than the Dhammakaya Foundation. While the event takes careful consideration not to be associated with this controversial movement, the proceedings clearly indicates a joint effort by the “Dhammakaya Foundation (DKF) and the Buddhist Youth Leadership Training (BYLT)” in organizing the opening ceremony on February 13, 2014. 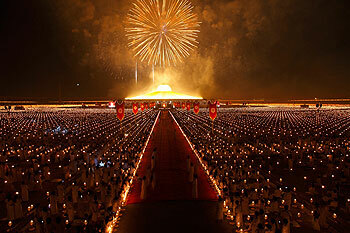 The venue of the opening will be held at Wat Dhammakaya itself, famed for its golden domed, UFO shaped pagoda. Recipients of the award are also expected to participate in the Magha Puja event held the very next day, which will also take place at Wat Dhammakaya. For the uninitiated, the Dhammakaya Foundation is known for its extravagant “pujas”, where tens of thousands or even millions of followers gather around the central shrine in elaborately choreographed Nuremberg-style rallies. Its flamboyant ceremonies have become increasingly bold displays of power, leading some to question its cult-like nature. The movement’s notoriety in Thailand stems from its aggressive fund raising activities, where its members are urged to donate “generously” as means of merit making. This follows it’s credo that says “To live a pure unselfish life, one must count nothing as one's own in the midst of abundance”. Some devotees have been found to be heavily indebted just to meet their obligations to support the movement. It's core “business” is a foundry that makes little golden Buddhas which entices donor to fork out at least Thai Baht 30,000 (US$ 1,000) to have their names engraved on it and then having it displayed at the UFO pagoda. There are at least a million of these Buddhas in the temple’s vicinity. This does not include the lucrative amulets business, where owners are often found giving testimonies at functions, telling prospective buyers how their lives changed once they wore them. Devotees are told of “millionaire forever” programs, where meditation (their own unique method) is practiced not just for the sake of attaining calm and peace, but to use that peaceful state as a launch pad to become successful materially. Due to its immense public appeal and marketing prowess, Dhammakaya has over the last few years consolidated itself into a financial behemoth. Since the acquittal of its leaders from financial misappropriation - which could have landed them in jail in 2006 – Dhammakaya has not only gained financial muscle but has also made inroads in influencing the political elite, both in Thailand and globally. However, despite having its own 24-hour satellite TV station, it has diligently worked to avoid the limelight. Until now. This inaugural “World Buddhist Outstanding Leader Award” is a step towards that awakening. For an award as prestigious sounding as this, it is a wonder that none of the well-known global Buddhist luminaries, such as the likes of the Dalai Lama, Lama Zopa, Bhikkhu Bodhi, Kyentse Rinpoche (famed film producer), Ven Cheng Yen (founder of Tzu Chi Foundation), Bhikkhu Thannisaro (sutta translator of "Access to Insight"), Ven Pannyvaro (Buddhanet), Robert Thurman, Joseph Goldstein, Ajahn Sumedho, Ajahn Brahm, Ayya Khemma, Ani Choying, Sulak Sivaraksa, Ananda Guruge – to name a few - are not in the list. These individuals have deeply influenced the development of Buddhism and Dhamma propagation throughout the world, over many decades. Surely they are worthy of being noted as “outstanding world Buddhist leaders”. Instead, what is obvious is that persons and organizations affiliated with the World Fellowship of Buddhists (WFB) and World Fellowship of Buddhists Youth (WFBY) form a bulk of the recipients. Among the Bhikkhu Sangha, four of them are directly associated with Dhammakaya. People will generally want to know the criteria used in selecting these individuals and organizations for the awards. Make no mistake. The time has come where “the temple of profit” has decided to come out of its shadows and announce its presence to the world. Award recipients from 10 different countries shall bear witness to this rise, bowing with salutation while being handed their personal recognition. Dhammakaya Foundation has certainly realized the value of riding on the extensive youth network developed over the years by WFBY. Laying their tentacles on just this one organization gives them an outlet to reach out to millions of youth all over Asia. It is very likely that the presentation of this award is an approach by Dhammakaya to draw Buddhist leaders from various countries to their home base, providing them with some form of “shock and awe” so as to win over their approval. While wealth and power may bring quick access in the short term, truth and insight shall reveal the true nature of Dhammakaya’s motivations. Let’s just pray that the award recipients have the awareness and wisdom to actually see through the real purpose of this event.